After checking out some of the 2017 offers in Margaux, we’re going to head south to Pessac-Léognan to look at the futures offers for the Grand Cru Classé (red) estates of Domaine de Chevalier and Château Smith Haut Lafitte as well as Larrivet Haut-Brion and Les Carmes Haut-Brion. If you are new to the series, check out our first Bordeaux Futures 2017 post covering the offers of Palmer, Valandraud, Fombrauge and Haut-Batailley. There you will get caught up on the general approach here at SpitBucket to buying futures for this vintage as we aim for finding value and “cellar defenders”. You can also check out the links at the bottom of the page for previous posts in this series. While the origins of the estate dates back to the 1600s, the modern history of Domaine de Chevalier began in 1865 when it was purchased by Arnaud Ricard. The property stayed in his family’s hands for more than a 100 years going through a series of name changes from Chateau Chivaley to Chateau Chevalier and, finally, Domaine de Chevalier. In 1983, the estate was purchased by the Bernard family whose history in the Bordeaux region dates back over 8 centuries. The Bernards put their young 23 year old son, Olivier, in charge as the new owners began rapidly improving the property and expanding the vineyard holdings. Vineyard plantings of Domaine de Chevalier. Notoriously prone to frost damage, Olivier removed several trees bordering the vineyard that would trap cold air around the vines. In other vintages, Domaine de Chevalier would employ the use of wind machines and even helicopters hovering over the vines to circulate warmer air. The Bernard era also saw a series of replanting that uprooted Cabernet Sauvignon vines in under-performing parcels and replacing them with Merlot. Over the next couple decades, the percentage of Cabernet Sauvignon in the vineyard would drop from 80% to now around 63% in the estate’s 80 hectares (198 acres). All the vineyards are farmed sustainably with some parcels farmed biodynamically. 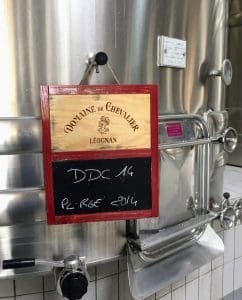 Today Olivier is joined with his two sons, Hugo and Adrian, and the together the family has pioneered many new techniques in Pessac-Léognan including the use of Diam corks. A hotly debated topic in Burgundy, Diam has been gaining some favor among producers of white Burgundy (such as Domaine Leflaive, Bouchard Pere et Fils, William Fevre and Louis Jadot) as one means of curbing the prevalence of “premox” (premature oxidation). Domaine de Chevalier started using the closures in 2015 for their white wines but by the following vintage all of the estate’s wines were sealed with Diam corks. In addition to Domaine de Chevalier, the Bernards are also partners in the Sauternes Premier Cru estate Chateau Guiraud. In 2012, they purchase Chateau Haut Caplane in Sauternes which they renamed Clos des Lunes to produces both dry and sweet wine. 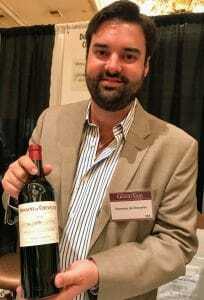 In Graves, Olivier Bernard also helps manage Chateau Lespault-Martillac and Domaine de la Solitude. The 2017 vintage is a blend of 70% Cabernet Sauvignon, 25% Merlot and 5% Petit Verdot. Around 6,500 cases a year are produced. Hugo Bernard pouring the incredibly delicious 2010 vintage at the 2017 Wine Spectator Grand Tour. Given its history, when news of the late April frosts came out, this was one of the estates that I’d expected to be hard hit. But it looks like with a bit of luck and a lot of (probably expensive) preventive action, Domaine de Chevalier came out relatively unscathed. Despite the likely higher costs of production this year, I’m pleased that the Bernards are keeping the price of their 2017 release more in line with their 2014 release instead taking the crazy Pomerol-approach of carrying on with price increases as if vintage quality doesn’t matter. I’ve been a big fan of Domaine de Chevalier for many years, finding their quality level to be high in everything from poor years to outstanding. They are an estate that I have faith in to deliver consistently excellent wines so with a reasonable offer this 2017 is a safe Buy for me. Under the name “La Rivette” (meaning small stream) and ownership of the Marquis de Canolle, the wines of Larrivet Haut-Brion were highly regarded prior to the French Revolution. Even into the 1800s, the wines of the estate were ranked by André Jullien in his 1816 work Topographie De Tous Les Vignobles Connus as on par with those of fourth and fifth growths in the Medoc. But the next century plus would see a series of inheritance issues and financial hardship as parcels were sold off to neighboring estates like Ch. Haut-Bailly. By the time that Jacques Guillemaud purchased the property in 1940 it was down to just 3 hectares of mostly untended vines. When the 1955 Graves Classification occurred, Larrivet Haut-Brion was still just a shadow of a domaine that it once was and thus was left out of the classification. Over this time period, the name of estate changed numerous times from Ch. Brion-Larrivet in 1860 to Chateau Haut-Brion-Larrivet in 1874 to finally in 1949, after a series of lawsuits by Ch. Haut-Brion, its current incarnation of Ch. Larrivet Haut-Brion. 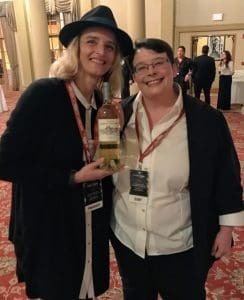 The author with Émilie Gervoson of Larrivet Haut-Brion at the 2017 UGC tasting of the 2014 vintage. Today the estate is owned by the Gervoson family who purchased the property in 1987. The Gervosons has continued the work started by Guillemaud of restoring Larrivet Haut-Brion to its past prestige with investments in the vineyard and winery. Michel Rolland was brought on to consultant but in recent vintages has been replaced by Stephane Derenoncourt. The vineyards of Larrivet Haut-Brion cover 61 ha (150 acres) of 55% Merlot, 40% Cabernet Sauvignon and 5% Cabernet Franc with plans to add Malbec and Petit Verdot in the future. Like many Graves property, this ratio shows a decrease in the amount of Cabernet Sauvignon planted over the years. The estate benefits from some enviable terroir with vines planted close to the Grand Cru Classé estates of Haut-Bailly and Smith Haut Lafitte as well as the Lurton property Ch. La Louvière. I’ve been fairly impressed with Larrivet Haut-Brion for delivering consistent value in the sub-$45 range but they always seem to be wines that require patience. I think the comparison to a Medoc 4th/5th growth is very apt. The 2009 was around $40 on release (now it averages $60) and has been drinking outstanding for the last 3 years. It has the stuffing to go on delivering more pleasure easily for another 10 years (sadly I think I’ve drank the last bottle in my cellar) but, man, was this wine tight as nails for the first 3 to 4 years after release. That’s perfectly fine for “cellar investment” wines but that is not my objective in buying 2017. After stocking my cellar with quite a few 2015/2016 that are going to need time (including Larrivet Haut-Brion), I’m counting on my 2017 purchases to be “cellar defenders”–able to deliver more immediate pleasure and short-term consumption. My experience with Larrivet Haut-Brion suggests that it is not going to fit that bill though I’m sure many other Bordeaux lovers are going to richly enjoy the value and over-performance of these wines 7 to 10 years down the road. So for me this will be a Pass but it will certainly be a smart buy for other folks. The origins of Les Carmes Haut-Brion began as a gift by the Pontac family of Ch. Haut-Brion of a watermill and some land to the local order of white friars (Grand Carmes) in the 16th century. The Carmelites would plant vineyards and manage the property for the next 200 years until the French Revolution when the land was confiscated and sold to the Chantecaille-Furt family. The chateau of Les Carmes Haut Brion. Les Carmes Haut-Brion stayed under the stewardship of this one family for over another 200 years until Didier Furt sold the property in 2010 to real estate mogul Patrice Pichet for a then record of 3.8 million euros/hectare. This astonishing price was reach after Pichet came ahead in a bidding war for the property with the Dillon family, owners of Ch. Haut-Brion who desperately wanted to reacquire the prime terroir that was once part of their estate. Soon after finalizing the purchase, Pichet began working to increase the production by acquiring neighboring vineyards. The next year, Pichet brokered a deal with Ch. Smith Haut Lafitte to acquire Chateau Le Thil with the parcels of vines being split among the two estates. In 2013, he added 17 acres of vines by purchasing Chateau Haut-Nouchet. Today the estate covers 25.5 ha (63 acres) of vines planted to a ratio of 41% Merlot, 39% Cabernet Franc and 20% Cabernet Sauvignon. Following each vineyard addition, many of the under-performing plots are uprooted and replaced with new plantings (often Cabernet Franc) that initially go into the second wine, Le Clos de Carmes Haut Brion, until they prove their quality for inclusion in the Grand Vin. The eventual goal is to have Cabernet Franc account for around 50% of vineyard plantings. At the time of the sale, Stéphane Derenoncourt was the consulting winemaker with Thierry Rustmann, the former owner of Ch. Talbot and current owner of the Pomerol estate Château Beau-Soleil, assisting. But soon Pichet brought in Guillaume Pouthier, a former protege of the Rhone superstar Michel Chapoutier, as winemaking director. Among some of the unique techniques that Pouthier practices at Les Carmes Haut-Brion is the frequent use of whole cluster fermentation (often around 45%). The estate is also experimenting with the use of clay amphoras for aging–have as much as 5% of the year’s production aged in terra cotta instead of barrels. The 2017 vintage is a blend of 41% Cabernet Franc, 30% Merlot and 29% Cabernet Sauvignon. Around 2,700 cases a year are produced. The 1998 Les Carmes even surpassed the 2005 Latour and 2000 Lynch-Bages. It was that good. This is a battle between head and heart as I absolutely adore Les Carmes Haut-Brion. Both the 1998 (Ave $90) and 2010 vintages (Ave $70) rank up there as some of the most pleasurable and character driven Bordeaux wines that I’ve ever tasted. You can taste in these wines how special the terroir is and why it provoked such a passionate bidding war–especially with Haut-Brion involved. As one of the few Cabernet Franc dominated Bordeaux (even more of a rarity on the Left Bank), Les Carmes Haut-Brion stood out in tastings and commanded attention. 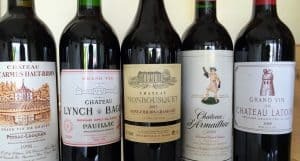 Yet it was always under the radar, often with many Bordeaux lovers not even knowing the estate existed–much less knowing how exceptional the quality was. But sadly that has been steadily changing as the prices and acclaim are starting to catch up. I’m also a bit concerned with the flurry of vineyard expansion. While it’s a nice story that the new owners are taking a “wait and see” approach with the new vines, adding different parcels and different terroir ultimately always ends up making a different wine. It may still end up being a very good wine but with the 2017 pricing being much closer to the 2015/2016 range than the 2014s, I’m going to have to take my own “wait and see” approach and Pass for now. A very old estate, the Du Boscq family started planting vines on the hill of Lafitte in 1365. The “Smith” in the name came courtesy of a Scotsman, George Smith, who purchased the property in 1720. Smith Haut Lafitte would go through a succession of owners over the next couple centuries, including a period in the mid-19th century when was owned by the mayor of Bordeaux as well as the president of the Chamber of Commerce during the time of the 1855 classification. For most of the 20th century it was owned by the Bordeaux négocient firm of Louis Eschenauer but it wasn’t until Daniel and Florence Cathiard acquired the estate in 1991 that a serious investment in quality wine production would begin. Under the Cathiards, the use of mechanical harvesting was eliminated with workers harvesting the grapes into a custom-designed trough that Daniel Cathiard crafted based on hods used by Himalayan Sherpas. In 1995, they invested in building their own cooperage with more than 70% of the barrels used at Smith Haut Lafitte being produced in-house. The estate was also one of the early adopter of utilizing optical sorting tables as well as satellite imagery over the vineyards to determine optimal harvest times. Michel Rolland and Stephane Derenoncourt serve as consultants with Fabien Teitgen as technical director. In the vineyard, Smith Haut Lafitte has been undergoing a steady conversion to biodynamics. The 2017 vintage is a blend of 60% Cabernet Sauvignon, 35% Merlot, 4% Cabernet Franc and 1% Petit Verdot. Around 10,000 cases a year are produced. The days of Smith Haut Lafitte being a screaming value are long since gone but they are an estate that can be reliably counted on to produce very good wine even in less than stellar vintages. They can also be counted on to increase in value as folks who bought futures of the estate in the mid to late 2000s can attest. But while I have no doubt that the 2017 is going to be a top notch wine, at an average of $98, I have little reason to want to bite when I could get the 2014 at a better price or even 2015 for just a couple dollars more. For my wallet and purchasing objectives, this is a Pass. Tagged André Jullien, Antonio Galloni, Arnaud Ricard, Bernard family, biodynamic, Bordeaux futures, Bordeaux vintages, Bouchard Pere et Fils, Cabernet Franc, Cabernet Sauvignon, Cellar defender, Ch. Haut-Brion, Ch. La Louvière, Ch. Latour, Ch. Talbot, Chantecaille-Furt, Château Beau-Soleil, Chateau Guiraud, Chateau Haut Caplane, Chateau Haut-Nouchet, Chateau Le Thil, Chateau Lespault-Martillac, clay amphoras, Clos des Lunes, Daniel and Florence Cathiard, Decanter, Diam corks, Didier Furt, Dillon family, Domaine de Chevalier, Domaine de la Solitude, Domaine Leflaive, Du Boscq, Émilie Gervoson, Fabien Teitgen, French Revolution, George Smith, Gervoson family, Graves Classification, Guillaume Pouthier, Guillemaud, Haut-Bailly, Hugo Bernard, James Molesworth, James Suckling, Jane Anson, Jeb Dunnuck, Jeff Leve, JJ Buckley, K&L, Larrivet Haut-Brion, Les Carmes Haut-Brion, Louis Eschenauer, Louis Jadot, Lynch-Bages, Malbec, Marquis de Canolle, Merlot, Michel Chapoutier, Michel Rolland, Olivier Bernard, Patrice Pichet, Pessac-Léognan, Petit Verdot, Pontac family, Premox, Smith Haut Lafitte, Spectrum Wine Auctions, Stéphane Derenoncourt, Sustainable Viticulture, Thierry Rustmann, Topographie De Tous Les Vignobles Connus, Total Wine, UGC tasting, Vinfolio, Vinous Media, White Burgundy, William Fevre, Wine Advocate, Wine Enthusiast, Wine Searcher, Wine Spectator, Wine Spectator Grand Tour.